After seven decades of waiting, scientists at Trinity College have photographic evidence proving that pitch is not a solid. 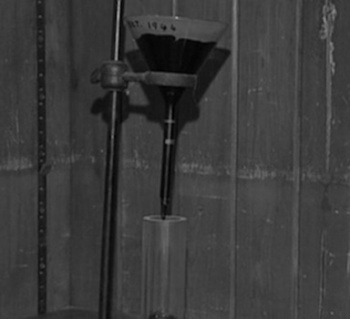 In 1944, Nobel Prize winner Ernest Walton and colleagues at Trinity College set up a seemingly simple scientific test. The researchers wanted to determine, once and for all, what sort of material pitch actually is. While increasingly uncommon in modern life, back in the '40s pitch was a facet of everyday existence, but the thick black substance had always straddled a confusing line between solid and liquid. It looks solid, and will remain in place if you attempt to move it, but at the same time it's deformable and won't support weight. Noticing these myriad properties, Walton's team placed lumps of pitch into a funnel, then placed the funnel in a jar, before sealing the whole thing off. The idea here is that over time the pitch would have to conform to one set of physical rules or another. If it remained in the funnel it could be described as a particularly squishy solid, but if it flowed out the bottom of the apparatus scientists would know that pitch is viscous. Over the years a few small drops of pitch fell from the funnel, but since no one was monitoring the experiment around the clock, these tiny drops of black goo weren't enough proof. Thus, when researchers recently noticed a new drop forming at the bottom of the funnel, they set up a 24-hour webcam to document the process, and finally prove once and for all that pitch can flow (but that it does so extremely slowly). One week ago, the Trinity College team revealed that it had captured imagery of the pitch drop falling from the funnel. Normally this is where we'd direct you to said imagery, but unfortunately Ireland's RTÃ‰ news network offers poor embedding options. You can watch a news report which includes the last moments of the experiment if you visit the network's official site. What practical applications does this discovery yield? Not many. This was one of those tests science periodically runs simply to determine why and how things work. Pitch isn't even that common these days, whereas it served as the go-to waterproofing element in the first-half of the 20th century. Propers to science for documenting proof of the goo's viscous qualities though. Now DARPA can get to work on weaponizing the stuff.